Welcome to the Laboratory of Dr. Josiah Townsend, located in 18 Weyandt Hall in the Department of Biology at IUP. Our research emphasizes the inherent connections between systematic biology and conservation, integrating field-based sampling, phylogenetics, morphological systematics, population genetics, and macroecological modeling into a framework that uses taxonomic inventory and monitoring to promote education and extension in support of broader conservation goals. While work driven by Dr. Townsend's interests tend to center around amphibians and reptiles, we enjoy having a diverse lab group with students whose interests range from jaguar conservation to environmental education. We maintain a dual geographic scope for our research efforts, with ongoing projects in northern Central America and northern Appalachia. Research in both regions centers on at-risk, fragmented ecosystems that are home to conservation-priority species, particularly amphibians and reptiles. Mesoamerican research sites are located in Honduras and Nicaragua, with a particular emphasis on endemic herpetofauna in the region's numerous montane cloud forests. Research in northern Appalachia are centered in western and central Pennsylvania, and emphasizes the effects of natural resource exploitation (such as Marcellus and Utica Shale extraction, wind farms, and coal mining) on native herpetofauna and herpetofaunal communities. Populations of lizards called Anolis (Norops) crassulus from Intibuca, La Paz, and Lempira represent a new species. The Honduran lineage of Anolis crassulus diverged from other lineages approximately 13 million years ago. Cladogenesis in the A. crassulus subgroup began approximately 22 million years ago, with the common ancestor originating in the Chortis Block. Recognition of the species Anolis heteropholidotus, A. morazani, A. rubribarbaris, A. sminthus, and A. wermuthi is supported. Anolis heteropholidotus contains at least four allopatric mitochondrial lineages. Cryptic, allopatric lineages were uncovered that are sister lineages to A. morazani (in the Sierra de Agalta) and A. rubribarbaris (in the Guajiquiro region of La Paz). Townsend Lab research was featured during the Inaugural Three Rivers Evolution Event, held on September 9, 2017, at the University of Pittsburgh. The event was sponsored by the Society for Molecular Biology and Evolution and the American Society of Naturalists and featured 48 oral and 63 poster presentations by faculty, postdocs, and students from 38 institutions from throughout the northeast. Townsend presented collaborative research with Lab Alumnus Erich Hofmann, in an oral presentation entitled “Evolution of a nonadaptive radiation of Mesoamerican highland anoles (Anolis crassulus subgroup).” Townsend Lab associate and IUP instructor Ileana Luque-Montes also received a travel award from the conference organizers to present her poster “Intergrative taxonomy of putative hybrid populations of leopard frogs (Ranidae) from Mesoamerica.” This project, led by Luque-Montes, was completed in collaboration with Townsend and two former IUP students, Erich Hofmann and Kayla Weinfurther, along with researchers from the University of Florida and Honduras. For a summary of IUP Biology's participation at TREE, check out the IUP news story here. Masters student Erich Hofmann was awarded the 2017 IUP Outstanding Graduate Research Award for his thesis "Cryptic diversity and phenotypic stasis in a complex of highland anoles (Squamata: Dactyloidae: Norops crassulus species subgroup)", which he successfully defended this Spring. Erich will be heading to Clemson University where he will join the Parkinson Lab for his PhD studies on the evolution of Neotropical pitvipers and their venoms, fully supported by a Trustees Doctoral Fellowship. Exemplary work by Erich over the past two years, he has set a very high bar for future students! Hess, AJ, MW Itgen, TJ Firneno, JC Nifong, and JH Townsend. 2016. Microsympatry in cryptic lowland salamanders (Caudata: Plethodontidae: Bolitoglossa subgenus Nanotriton) from northwestern Honduras: implications for taxonomy and regional biogeography. Journal of Zoological Systematics and Evolutionary Research (Online Early): doi:10.1111/jzs.12151. Abstract: The taxonomy of the diminutive bolitoglossine salamanders of the subgenus Nanotriton has previously been a source of confusion among specialists. 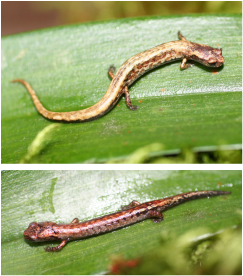 At various times, at least three different species of Nanotriton have been reported to occur in Honduras: Bolitoglossa nympha, B. occidentalis, and B. rufescens. Phylogenetic analysis of 16S and cyt b from samples from three localities in Honduras (departments of Yoro, Copán, and Cortés) confirm that most populations are assignable to B. nympha. 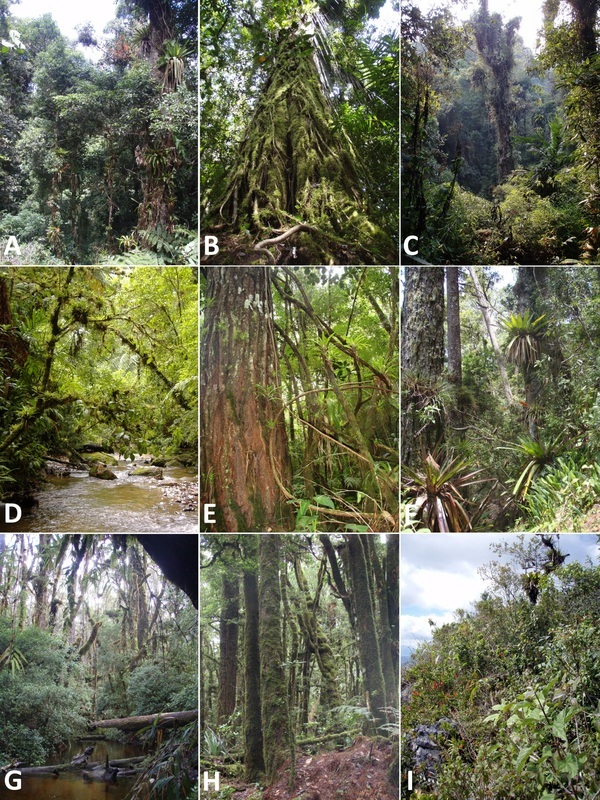 Nine samples collected from a single locality on the northern slope of the Sierra de Omoa, between 120–190 m in elevation, were found to represent two distinct taxa: B. nympha and B. rufescens. Field examination of these nine specimens found them to be morphologically indistinguishable, including a lack of maxillary teeth in all specimens. 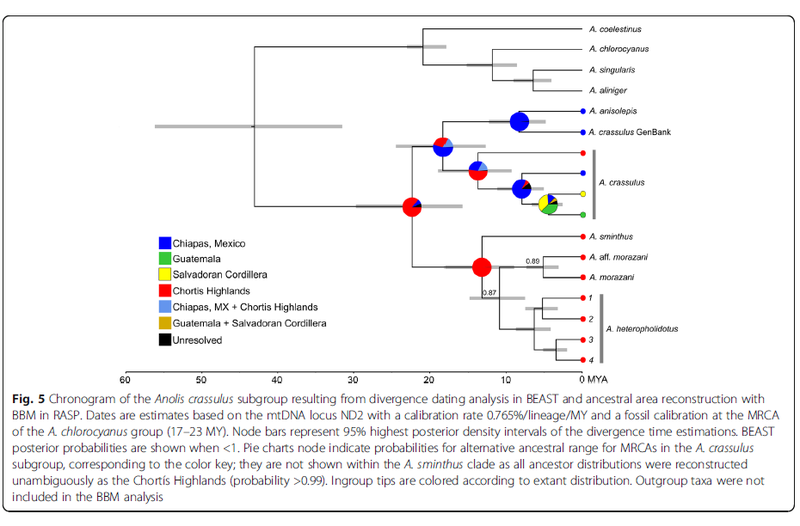 As such in situ identification of the two species in northwestern Honduras is problematic given the occurrence of the two taxa in microsympatry in at least one locality. The discovery of yet another divergent lineage of B. rufescens highlights the need for a taxonomic reassessment within this species complex. Townsend, JH. 2016. Taxonomic revision of Nototriton barbouri (Schmidt) (Caudata: Plethodontidae), with description of two new species of moss salamanders from the Cordillera Nombre de Dios, Honduras. Zootaxa 4196(4): 511–528. 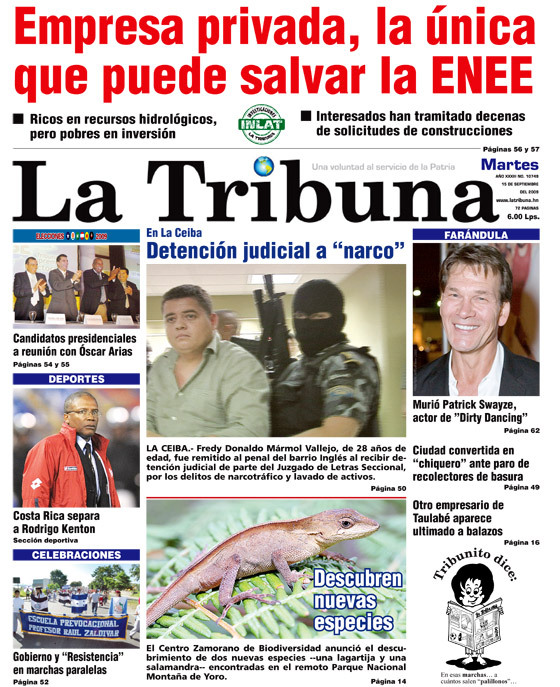 Abstract: Moss salamanders (genus Nototriton) are represented in northern Central America by nine putative species: N. barbouri, N. brodiei, N. lignicola, N. limnospectator, N. mime, N. picucha, N. saslaya, N. stuarti, and N. tomamorum. I estimate the phylogenetic relationships for these species based on data from three mitochondrial gene fragments (16S, cytochrome b, and COI), and compare morphological variation among putative taxa. As evidenced here and in previous studies, the taxon N. barbouri is paraphyletic with respect to populations from the Cordillera Nombre de Dios in northern Honduras. I restricted this taxon to populations from the Sierra de Sulaco in central Yoro, Honduras, and describe two new species from the Cordillera Nombre de Dios. Köhler, G, JH Townsend, and CBP Petersen 2016. Taxonomic revision of Norops tropidonotus (Peters 1863), with the resurrection of N. spilorhipus (Alvarez del Toro & Smith 1956) and description of two new species. Mesoamerican Herpetology 3(1): 8–41. A new paper by Gunther Köhler, Joe Townsend, and Claus Bo P. Petersen presents a taxonomic revision of the widespread anole Norops tropidonotus, and presents evidence for the resurrection of N. spilorhipis (Álvarez del Toro and Smith, 1956) and the description of two new species: Norops mccraniei, a primarily pine-oak forest inhabitant endemic to the Chortis Block, and N. wilsoni, a lowland rainforest edge inhabitant endemic to the northern slopes of the Cordillera Nombre de Dios. These two new species were named for Larry David Wilson and James Randy McCranie, the pioneering herpetologists that have worked to document the amphibians and reptiles of Honduras since 1967 and 1980, respectively. There combined work includes the description of over 100 endemic species, many of which are endemic to the country's cloud forests and offshore islands. The paper was published in the open access journal Mesoamerican Herpetology, and is available for download here. Congratulations to Mike Itgen for the successful defense of his thesis "Taxonomic revisions of two Magnadigita (Caudata: Plethodontidae: Bolitoglossa) from Honduras, on Wednesday, 15 June 2016. Mike will be joining the lab of Dr. Rachel Mueller at Colorado State University this Fall to begin his PhD studies. Another of our crew has passed his thesis defense, big congratulations to Alexander Hess for successfully defending his thesis "Community ecology and evolution of lungless salamander ensembles using temperate and tropical models" on Wednesday, 23 March 2016. Alex will be joining the lab of Dr. Ron Bonett at the University of Tulsa this Fall to begin his PhD studies. Longtime Lab member Kayla Weinfurther was honored as the recipient of both the 2016 Biology Outstanding Student Award and Cynthia Sushak Undergraduate Biology Fund for Excellence Award at the Biology Department awards ceremony on Friday, 18 March 2016. Kayla was recognized for her contributions in the classroom and the lab, based on her ongoing work looking at the evolutionary diversification of Mesoamerican true frogs. Congratulations Kayla! Townsend Lab everyman and soon-to-be alumnus T.J. Firneno successfully defended his MSc thesis "Integrative assessment of species boundaries in Mesoamerican toads (Incilius coccifer complex)" on Friday, 26 February 2016. Congratulations T.J, excellent job! TJ will be joining the lab of Dr. Matt Fujita at the University of Texas at Arlington this Fall to begin his PhD studies. Townsend Lab member Gretchen McCormick has been on award tour recently, winning the 2015 IUP Women's Senior Leadership Award and the 2014-15 IUP Department of Biology Outstanding Student Award. These awards recognize the hard work and dedication that Gretchen has demonstrated during her undergraduate tenure at IUP, and she gets a much deserved "congratulations"! Townsend, J. 2014. Characterizing the Chortís Block Biogeographic Province: geological, physiographic, and ecological associations and herpetofaunal diversity. Mesoamerican Herpetology 1(2): 204–252. Abstract: The geological history of Central America is remarkably complex, as the region has served as the biological dispersal route between North and South America, and also has been the site of extensive in situ evolution. Nuclear Central America is recognized as a region of high biodiversity, and the eastern portion of Nuclear Central America (the Chortís Block) largely has been overlooked as a biodiversity hotspot. In this paper, I present a characterization of geological, physiographic, and ecological associations to define the Chortís Block Biogeographic Province. The Chortís Block is partitioned into the Caribbean and Pacific Lowlands and the Northern, Central, and Southern cordilleras, which in turn are delimited into 24 distinct highland areas and 14 intermontane valleys. I provide contextualized definitions of ecological formations and identify six lowland-associated habitats, of which four habitats are shared between lowlands and highlands, and 10 habitats are associated with highlands areas. I present a summary of the diversity, distribution, and conservation status of the herpetofauna of the Chortís Block, using a combination of the published literature and results from 19 expeditions to over 60 localities from 2006 to 2014. The Chortís herpetofauna is characterized by a high degree of endemism (38% of all species are endemic) and equally high extinction risk (42% threatened, including 94% of endemic species). Endemism is highest among the salamanders (86%), followed by the lizards (43%), the anurans (38%), and the snakes (23%). Our lab research presentations at the SMBC Congress in Honduras were highligh﻿﻿﻿ted in the "Mentors" section of the Fall-Winter issue of IUP Magazine. Joe Townsend, Ileana Luque, TJ Firneno, Alex Hess, Gretchen McCormick, and Kayla Weinfurther attended and presented at the 18th Congress of the Society of Mesoamerican Biology and Conservation, held from 13-18 October 2014 in Copan Ruinas, Honduras. We organized the symposium "Promoting Protection of At-Risk Habitats through Priority Species Conservation", sponsored by the IUP College of Natural Sciences and Mathematics and featuring speakers from US Forest Service, IUP, University of Florida, and universities and institutions in Honduras, El Salvador, Costa Rica, Mexico, Colombia, and Cuba. Joe presented the keynote talk "Promoviendo la Conservación de los Bosques Nublados Amenazados en el Bloque Chortís a través de Inventarios Filogenético", and TJ, Alex, Gretchen, and Kayla all presented posters, with TJ and Alex winning first and second place in the graduate poster competition, respectively. Check out the news item on the IUP website here. We are proud to announce the launch of the journal Mesoamerican Herpetology! Mesoamerican Herpetology is a peer-reviewed, open-access, electronic journal dedicated to the study of the herpetofauna of Mexico and Central America. Its purpose is to (1) promote herpetological research throughout the region, (2) provide an outlet for the publication of noteworthy papers and notes, and (3) develop a greater level of interaction among biologists, students, conservationists, and other interested parties throughout the region.Submissions of papers and notes on natural history and distribution are now being accepted. Click here for Instructions for Authors. The editorial board is led by Managing Editor Louis Porras, and is made up of experts on regional amphibians and reptiles. Dr. Townsend is pleased to be serving as an Associate Editor and member of the Social Media Team and Taxonomic Board. 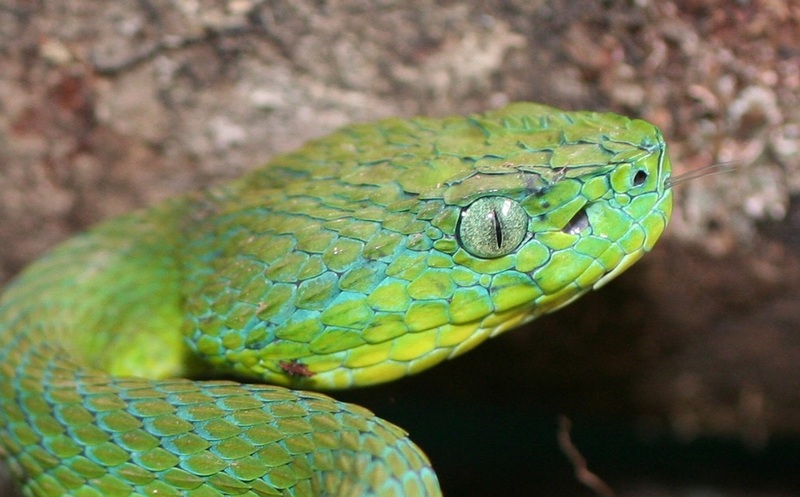 A remarkable new species of bright green palm-viper, Bothriechis guifarroi, has been described from a threatened cloud forest in Honduras, and is named to honor grassroots conservationist Mario Guifarro, who was assassinated in 2007. Despite being superficially similar to other Honduran palm pitvipers, the closest relative to the new species lives over 600 km to the south in Costa Rica. The study was published in the open access journal ZooKeys, and can be downloaded here. The IUP News Release can be seen here. Read more about Mario Guifarro here. Coverage of this story via Scientific American, National Geographic, Science Daily, Wildlife News, Science World Report, Monga Bay, from Venezuela, Russia, Bulgaria, Slovakia, China, the Netherlands, and Indonesia. A new species of moss salamander (genus Nototriton) is described from Montaña de Botaderos National Park in northeastern Honduras. The new species, Nototriton mime, is the first member of the genus known to exhibit sexual dichromatism, with males (top photo) being a pale yellow-brown and females (bottom photo) a darker mottled brown color that is typical of other species of Nototriton. The study was published in the journal Zootaxa, and the article is available here. Currently the species is known only from the highest portion of Montaña de Botaderos, in a patch of cloud forest less than 300 hectares in total extent, and we estimate that less than 1,000 hectares of potential habitat is available to N. mime in about a dozen isolated cloud forest fragments. This new species is named to honor our late friend Arquimides Gabriel Rosales Martinez, or “Mime” (pronounced me-may), a young Honduran biologist passionate about amphibians. Mime and his sister, Novy Hortensia Rosales Martinez, were killed by a drunken driver on 17 December 2010 in Tegucigalpa.